Cheers to 21 years for your Salvation Army Red Kettle Campaign! VolunteerSpot enabled Rotary Club members and the community to signup through a link placed on the Rotary website. When the need for Bell Ringers was announced through list serves or radio interviews, the community could then respond by accessing VolunteerSpot through the local Rotary website...It enabled the community to conveniently signup as Bell Ringers. The feedback to the Club was that the signing up was simple and easy! Today our spotlight shines on Steve Kallin, Volunteer Coordinator for the 2013 Jackson Hole Salvation Army Red Kettle Fundraiser, who uses VolunteerSpot's online signup sheets to organize volunteers. All funds raised are used locally to meet the needs of those living in the Jackson Hole Area. The entire effort is conducted by volunteers. This year approximately 200 volunteers contributed about 350 hours as Bell Ringers on Fridays and Saturdays (eight total days), between Thanksgiving and Christmas at four locations. This was the first year that an online signup system was used. There was a desire to reach out to the community and encourage volunteers from outside of the Rotary Club to become involved. The ability to signup online was key to encouraging more community participation. Bell Ringers were able to signup using a combination of VolunteerSpot and hardcopy signup sheets at the weekly Rotary Lunch Club meeting. In the past, volunteers signed up primarily at the weekly Rotary Lunch Club meeting using clipboards passed around the room. This approach was still used. VolunteerSpot allowed me to disable signups on Tuesdays to accommodate this hardcopy signup at the Rotary meetings. I later entered the information for these volunteers into VolunteerSpot and then enabled online signups. This was a bit inconvenient but an important step in helping this Club transition from hardcopy signups to an online signup system. Many members readily signed up online even though signup clipboards were available once a week. VolunteerSpot allowed information to be exported in csv. which could then be adjusted and used in a template for a hardcopy signup schedule. A printed final schedule would also accompany a red kettle at each location for each day, which provided contact information for each scheduled volunteer. Instructions and information were provided to each volunteer through a link in the confirmation signup email they automatically received from VolunteerSpot.This enabled basic information about Bell Ringer duties to be easily shared with volunteers that I would never meet or talk to. Reminder emails, which were automatically sent to Bell Ringers two days before their scheduled time slot, were certainly important in reducing "no-shows." Another important feature of VolunteerSpot is it made it easy to thank volunteers, both weekly and at the end of the fundraiser. A thank you email was sent at the end of each week. One week, Bell Ringers braved sub-zero temperatures to enable the community to donate at the red kettles. It was very nice to thank these Bell Ringers shortly after they volunteered. If you need a lot of volunteers, it's important to make it easy and convenient for them to signup. I wanted a tool that would make it easy for anyone in the community to join this effort and would also help me in organizing and managing volunteers. Also, because this is an all-volunteer, low budget effort, I wanted to find a "free" service. The reason I chose VolunteerSpot was because of the user support it provided. I looked at about 10 online volunteer programs and tested 4-5 of them. It was immediately apparent that VolunteerSpot had by far the most comprehensive and extensive user support program. The online FAQs, videos, and webinars were well done and easy to follow. I was also impressed by the short response time when emailing questions to VolunteerSpot. I received several replies within an hour! It was very important that the first attempt to use an online signup system for this longstanding community fundraiser be successful. I believe this successful year will encourage more community participation and support in the future. VolunteerSpot worked great! It was reliable and did everything I needed it to. We salute Steve and all the other volunteer leaders out there making a difference. If you're using VolunteerSpot, write and tell us about what you're doing and give us a chance to shine our Volunteer Spotlight on you!! Just email us at VS@volunteerspot.com. "There are many ways to define and sustain an inclusive culture where all students feel that they are accepted and supported as an essential part of the classroom and school community, and where all [adults] share the responsibility for making that happen." Inclusion is growing in prevalence and popularity across the country, and a successful inclusion classroom requires that all adults, especially parents, be informed and on board. According to its most basic and well-known definition, Inclusive Education is the practice of supporting students with disabilities full-time in their chronologically age-appropriate general education classroom. The key word there is “supporting”. Specifically, all students, especially those with Individualized Education Plans (IEPs), are given whatever what they need as designated by those IEPs in order to achieve high standards and succeed as learners as alongside their peers and within the context of the general curriculum. Furthermore, to be included in the general education classroom is considered a Special Education setting, but the Special Education services are met within that classroom setting. Special Education settings lie on a continuum from the most to the least restrictive (restrictive indicating distance between the setting and the general education classroom) and are recommended according to several factors, including the child’s present performance and specific implications of the disability. Meaning, it all depends on what’s best for the student, and some disabilities might be more visible than others. So, what does this mean for room parents? At Teaching2gether, we also think inclusion describes a certain classroom culture, and that a commitment to inclusion is essential for every stakeholder in the classroom. This type of classroom requires high levels of support, and this is best done as a community effort. - What are some specific measures I can take to make sure everyone can attend, equally participate, and feel comfortable at class events and play dates? - How can I help during class so that everyone feels properly supported? - How can I educate the classroom community about inclusion? Parents of children with disabilities can inquire about the best ways to inform their communities, rally support, advocate for their children, and promote the idea of inclusion being the essential idea of everyone learning together. So, how might you know your child is in an inclusive classroom, or what can you encourage for your child? The signs might not be as obvious as you think. Might have multiple teachers including at least one Special Education teacher, but their roles are indistinguishable. Are primarily managed by a set of a few, positively framed rules, often called “agreements” or “core values,” and are enforced by community meetings and logical consequences rather than overarching systems. Have students that can identify their own personal needs, wants, and learning styles, and are comfortable collaborating and partnering with their peers. Uphold “fair isn’t always equal, and equal isn’t always fair” as a common understanding. This may mean that students are given different accommodations and adaptive tools, depending on what they need, and students understand this. Stay tuned for our next post, featuring parenting and organizing tips for inclusive classrooms. At Teaching2gether we believe that professional collaboration is the key to successful inclusive education. When educators work well together, students with special needs flourish alongside their typically developing peers. At Teaching2gether we are committed to delivering exceptional professional development as a means to achieve these goals. We offer consulting services, on-site and virtual coaching, webinars, and interactive workshops to support all stakeholders working to provide access to a quality educational experience for students of all abilities. When developing our services for teachers, administrators, technologists or parents we draw on both current, research-based practices and our combined backgrounds as inclusive educators and consultants in New York City and Texas. Previous clients and employers include Community Roots Charter School (NYC), PBS Kids, BrainPOP.com, G&R Learning, and Region 13 Education Service Center in Texas. We're honored to be saving school leaders, room parents, team moms and educators HOURS and hours of time getting organized at back to school. Whether it's coordinating class helpers, volunteers for the fundraiser, team snack schedules, parent-teacher conferences, you name it - our free online signup sheets and volunteer calendars are THE solution for stressing less and doing more this school year. There are hundreds of apps, devices and online services designed to help organize your life and minimize stress. We narrowed the list down to 12 must-have (and mostly free!) options to help both kids and parents manage the school year ahead. Are you a class parent this year? In charge of the team snack schedule? Or did you get roped into organizing the annual carnival at your kid's school? This online service is great for coordinating parent helpers for school or after-school activities. Quickly schedule jobs and items needed, invite parents to sign up and send automated reminders help parents remember when it’s their turn to pitch in. VolunteerSpot is a free service that helps you manage and communicate with your volunteers and team members. 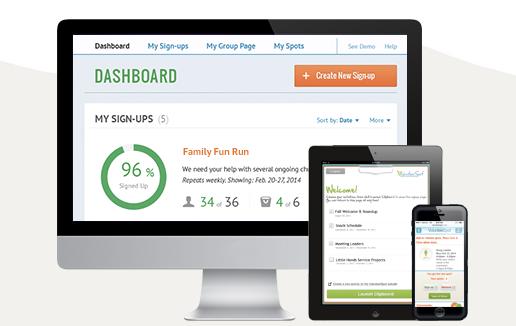 Created by a working mom frustrated with reply-all emails and the hassle of mobilizing volunteers, VolunteerSpot offers free software and sign-up sheets that you can access from your computer, tablet, or phone. It makes it easy to schedule and track your volunteers so that you no longer have to stress about how many people will actually show up, or spend all day calling and sending emails to different people, trying to figure out when everyone is available. There's even automated reminders and the ability to sync e-calendars, so there's no excuse for forgetting a shift. This is a great service to use for event fundraising, when you have to wrangle a large group of volunteers to help plan and manage something like a fun fair or walk-a-thon. It's especially useful for high school or elementary school fundraising, when you're trying to coordinate with working parents for after-school events. Your Fall fundraising basket doesn’t have to be filled with wrapping paper swatches, crumpled up old order forms, and melted candy bars anymore. The future of fundraising has more parents getting involved in a simple, on-the-go way with companies like our friend and sponsors at Shoparoo! ~ Hassle-free school fundraising: No more cutting and collecting labels or selling door-to-door. Snap pictures of your everyday shopping receipts right from your smart phone to earn cash for your school. ~ A variety of ways to contribute: Receipts from retailers that sell grocery products earn cash donations for your school every time, while receipts from restaurants and other retailers enter your school to win monthly and yearly sweepstakes worth up to $15,000. ~ No restrictions: Unlike other fundraisers, it doesn’t matter where you shop or what you buy - Shoparoo will reward you for every shopping receipt. ~ Bonus rewards: Be rewarded extra for referring friends, completing short surveys, scanning barcodes, and submitting receipts every week. ~ Friendly competition: Grade competitions with Shoparoo make fundraising FUN and boost school spirit! Offer a pizza or popcorn party to the winning class and you’ll see just how much fun and rewarding Shoparoo can be. Don’t have a school to support? You can also use Shoparoo to donate your receipts to support the victims of natural disasters by selecting the American Red Cross as your cause. Join over 7,000 schools nationwide that have already raised thousands of dollars through the Shoparoo app! "Wow this is an awesome app - we just started at our school and only have about 20 people so far but we already have 19,800 Roo Points. I love this app and that it supports our schools!" After-School Cool: When You Plan, You Win! After-school activities play a vital, positive role for children in fostering their interests, values and growth, and those activities take lots of coordination. Now is your chance to be After School Cool in the VolunteerSpot ‘Back 2 Cool’ Sweepstakes event and win amazing experiences for your after-school groups, your school and you! Check out the awesome 'After-School Cool' prizes you can win for you and your school below! BONUS: By participating, you're also automatically entered to win the grand prize in our Big ‘Back 2 Cool’ Sweepstakes – one of 3 - $1,500 Grants for your School and an iPad for you! Remember, share this giveaway with your friends and others at your school, and you can increase your chances of winning. Cabot Creamery is a cooperative of 1,200 dairy farm families located throughout upstate New York and New England. They manage four plants in three states, employing over 1,000 people, who make the best dairy products on the planet. Look for award-winning cheese and other dairy products made with love and pride in Cabot and Middlebury, Vermont and Chateaugay, NY. Care.com is the world's largest online destination for care. They connect families with quality caregivers and caring companies. They offer a reliable and easy-to-use platform to help parents make informed decisions about finding and managing quality care for their children. Common Sense Media is a non-partisan, non-profit organization dedicated to improving the lives of children and families by providing the trustworthy information they need to thrive in a world of media and technology. They offer tools for families to have a choice and a voice about the media they consume. Kiwi Crate was created to celebrate kids’ natural creativity and curiosity. Through a variety of activity kits designed-specifically for children that are shipped monthly, they make it fun and easy for children and parents to spend time building, exploring and creating together. Soap.com offers more than 25,000 products under one virtual roof bringing you the convenience of the local drugstore without long lines, heavy bags or cranky cashiers. Just your favorite products that keep your life in balance, conveniently shipped to your door faster and easier than any errand you've done before. * The Care.com individual prize consists of a $150 FreeTime credit to pay a caregiver of their choice though the Care.com site, as well as a 1 month free premium membership, with a total retail value of $190, less applicable transaction fees. Only 5 prizes of the $150 FreeTime credit and 1 month free premium membership will be issued. FreeTime credit may be used to pay caregivers who accept payments though the Care.com site. Transaction fees may apply. Credit expires one (1) year after issuance. Once full payment to your caregiver is processed via a credit/debit card, Care.com will credit that card in an amount equal to your FreeTime credit, which cannot exceed the total amount of your payment. ^ The $500 Fun Grant prize winner will be asked to award a $500 American Express gift card to the official after school organization of their choice (afterschool program, competitive club, sports league, Scouts, religious education, etc.). The American Express gift card will be given directly to the organization. Prizes cannot be redeemed for cash and no substitution or transfer of such prizes by winners is permitted. Parents have had some adjustments to make in recent years when it comes to parenting methods, as a result of advancements in technology. Now with the impact of smart phones and tablets, it is important for your kids to use technology in a positive way. Take note on the best, free mobile applications to make sure your kids break into a routine that teaches them useful skills for the classroom at multiple grade levels and subject matter. A Kids Academy Company app geared toward students just entering school, this app introduces kids to reading, writing and arithmetic components. Users learn these subjects through a series of games enjoyable to them and displayed with vibrant, innovative illustrations. Children are also able to work and proceed at their own pace. Start your child’s intellectual journey off right with Funbrain and help your child complete each game of the app that has it all. Funbrain helps preschoolers and kindergarten students recognize number and word sequences and develop literacy skills. Expand your child’s developing vocabulary by exposing them to lively animations provided by Age of Learning, Inc. Your kids will recognize upper and lowercase letters, capitalization regulations, phonetics and sounds. Promote the importance of reading in an entertaining read-along app, such as Farfaria. This app’s library is stocked to entertain a range of ages from 1-9 and includes classic and new stories to get your child excited about reading. Encourage your child to practice their mathematical skills and perfect the rules of multiplication and division with digital flashcards. Custom each session with any aspects your kid may need extra help with as well. Begin to develop your child’s critical thinking skills by using Elevate, which adjusts training activities to the user’s process while using the app. The app’s different sessions train the brain to recognize patterns to challenge and evolve user’s grammatical, pronunciation and problem-solving skills. Named as Apple’s “2013 App of the Year,” Duolingo will help well round your child’s skills in other languages, including Spanish, French, German, Italian and English. This app puts a fun spin on learning new languages as you compete with other users and advance to different levels. Why not get in on the interactive learning yourself with applications, such as iTunes U. Complete online courses from raved universities in your own home and expand your knowledge as well. Choose from the largest catalog of free courses covering a variety of subjects at your fingertips. With the kids back in school, claim a little space for yourself ....in the carpool line, waiting at practice, during homework time in the evening...and count on these top reads. You couldn’t get enough of her on Saturday nights, and as a mom, you were probably too busy in 2011 to indulge in the comical stylings of Tina Fey. This timeless take of the mother-daughter relationship will be a good read for the first time or second to brighten your busy days. Social worker Ellen Moore witnesses the hardships her line of work presents in dealing with humanity. When Ellen encounters Jenny, a recent girl who’s found herself living on the streets, the other learns more than expected from the other. This tale captures the beauty of motherhood under different circumstances. When Portia Cuthcart makes the decision to leave Texas and never have the opportunity to work in the Glass Kitchen her grandmother built, she moves to Manhattan and vows to never cook again. Things stir up when she meets a 12-year-old girl and her father and finds herself cooking up different plans. A New York wedding florist never believed in love, despite her occupation surrounding nuptials. However, she stumbles across a life decision when the bride of one of the weddings she’s working disappears, and is left to reevaluate her stance on love. Indulge in a deep read as summer winds down and revisit August of 1954. This story retells the challenges of segregation in a touching manner. Go on a journey and experience love and sadness in this New York Times best seller. Travel through the town of Friendswood and relate to the families experiencing the unknown when a tragedy strikes their small town. This novel has everything you’re looking for - from family to suspense to faith. Struck by tragic and taken at only 22 years old, the scholarly Yale graduate left behind a scripted legacy in her essays collected in The Opposite of Loneliness. After reading Keegan’s stories, anyone can relate to her rising question of discovering who we’re truly meant to be. Join the Posts family and take an extended vacation overseas for a serene, intimate family vacation. Discover yourself, laugh and cry as you turn pages of Straub’s end-of-summer must read. There’s no need for you to feel alone when you don’t have it all together. Here is your chance to turn to someone who will tell you it’s OK to not be perfect. Spend time with the perfect girlfriend, as life goes into full swing again. A poignant and inspirational love story set in Burma, The Art of Hearing Heartbeats fills the senses with rich descriptions spanning the decades between the 1950s and the present. When a successful New York lawyer suddenly disappears without a trace, neither his wife nor his daughter Julia has any idea where he might be…until they find a love letter he wrote many years ago, to a Burmese woman they have never heard of. Heading back-to-school soon? What's the best way to get involved in your child's education and make a difference in the classroom? Ensure a successful year for your child - join the conversation with VolunteerSpot.com & BOOSTCollaborative.org! You can win BIG at back-to-school! We'll be selecting one random winner from twitter party attendees to win a $25 Target e-gift card from VolunteerSpot & another to win a ton of school supplies from BOOSTCollaborative! Community Based Care of Central Florida is a non-profit agency charged with developing community-based services and supports for children and families served by the child welfare system in Central Florida. A core value is the belief that all children have the inalienable right to grow up safe, healthy and fulfilled in families that love and nurture them. We have been committed to serving the children and families of Central Florida who have been victims of, or at risk of, abuse, neglect or abandonment since 2004. CBC is Florida's child welfare initiative that transfers public child welfare services to the private sector. In response to this initiative, a group of local providers came together to develop a community-based "lead agency" that combines compassion and innovation with flexibility. The result is CBC of Central Florida. Today, our Volunteer Spotlight shines on Lydia Santis, Mentor and Volunteer Coordinator, Community Based Care of Central Florida, who uses VolunteerSpot's free online signup sheets to coordinate volunteers for their Christmas Extravaganza. Our organization has 2 volunteer opportunities; we recruit Volunteer Mentors for our Legacy Mentor Program that serves our foster youth in the tri county area. Our second opportunity is our annual Christmas Extravaganza. Our Extravaganza incorporates over 150 volunteers to serve over 2,000 foster youth and their families. We provide gifts for our Foster families to give to their foster children on Christmas Day. We also have a Santa Claus to take pictures with, multiple craft stations, bike giveaways and lunch. We used Volunteer Spot as our sign-up for Volunteers. We had multiple stations with different time slots that our volunteers could sign up for. We also needed a master list of all the volunteers to use as a sign-in sheet that day. Because of Volunteer Spot we were able to stay organized and assign volunteers accordingly. Be flexible! Some volunteers may stay the entire event and help clean up, other may need to leave early and may not inform you till the event. Instead of getting frustrated remember their giving the gift of their time. We needed a site where volunteers could sign up with multiple volunteers and see what other people had volunteered for. Before we would send out an excel sheet to individuals and spend extra effort changing volunteers around who had signed up for the same time slot. We also needed to know when a volunteers cancelled. On Volunteer Spot it alerted us right away and let us know what time and station they had cancelled. Because of this we were able to fill those slots quickly with new volunteers. We salute Lydia and all the other volunteers out there making a difference. If you're using VolunteerSpot, write and tell us about what you're doing and give us a chance to shine our Volunteer Spotlight on you!! Just email us at VS@volunteerspot.com. Designate an area in the opening where parents enter and exit for Open House night where you can display posters with the school's twitter and Instagram handles and facebook and pinterest pages. Also include links to the school and parent group websites and collect email addresses for parents who want to receive email newsletters. Bonus: Post a QR code that parents can scan with their smartphone to go to a page with all the school's web and social info, how to here. Put down the clipboards and break out the iPads! Ditch long lines and paper sign-ups for digital, online (free) volunteer scheduling tools from VolunteerSpot. Use the "Clipboard" iPad app to virtually sign parents up on the spot (capturing their email and other info), download it here. Or post a list of available volunteer opportunities coming up and let parents know they'll receive signup links via email in the near future. A FUN activity booth is a great way to engage parents and get them to open up with one another. Photo booths are easy DIY fun - simply grab a colorful sheet and hang it as a background, collect funky props like over-sized sunglasses, fake mustaches, you name it and recruit a volunteer to take pictures with a smart phone or digital camera. Photos can be posted on the school website or onto the school Flikr account for parents to view. Open House is a great time to sell spirit wear and other school items to eager families new and old. It also helps your school parent group get a jump on fundraising for the year. Recruit smiling, friendly volunteers to staff this booth and encourage them to not just sell, but talk to and get to know the parents - encouraging them to check out other booths before the parent group presentation. Whether you're collecting dues, handing out school calendars, giving directions around the school, you name it, staff your question and comment booth with friendly volunteers who know their stuff. For school parents with questions for the parent-group leaders, have a shoebox and index cards for parents to write down their questions and drop them in. The school-parent group President can read and answer them at the end of their presentation. Tech Smart: Saving Time is Always a Win! It’s Topic #1 of the VolunteerSpot “Back 2 Cool” Giveaway, so get ready to be tech smart and win big! As research has shown, the fast-paced changes in technology creates unique challenges for schools, so now’s your chance to help. Cozi is a free app and website, which helps you manage the chaos of family life with a shared calendar, shopping lists, to do lists and more. Cozi keeps track of everything from school schedules and sports activities to grocery lists, meals and chores. It’s all in one place the whole family can access anytime, anywhere. Get Back to Cool & Win for Your School! Enter to Win 200+ Prizes Worth $20,000! Start the school year off right. Get rewarded for getting organized this year with the VolunteerSpot “Back to Cool” Giveaway! It’s a winning combination of five sweepstakes with valuable prizes and timely topics that will help you prepare for the upcoming school year AND give back to your children’s school. And you’ll be rewarded just for entering! Between August 11 and September 19, we’ll present four back-to-school topics that are really important for both parents and teachers: using technology to stay organized, effectively coordinating after school activities, supporting teachers and planning healthy snacks. More Exciting Prizes for You (and to share with your Teachers)! Saving Time is Always a Win! The latest and greatest GOOD news and stories to make us smile are all about ingenuity, creativity, and beating the odds - enjoy! Do you know what your kids are watching on TV or online? Are your kids watching TV or using the internet right now? Do you know what shows they are watching or sites they are visiting? Do you worry that they may be exposed to inappropriate content or communication? Have you been putting off discussions about responsible internet use with your children because you just don't know where to begin? ControlwithCable.org, a recent initiative of the National Cable & Telecommunications Association’s Cable Impacts Foundation, is here to help parents keep their kids safe! This new portal provides one-stop access to information about available television and online parental control tools, as well as educational resources for supporting parents in protecting their children in an age of unprecedented access to media. Controlling what television programming and online content children have access to has become more difficult for parents as the market has exploded with multitudes of offerings, services, and affordable devices for kids of all ages. In response to this, cable providers have helped pioneer several solutions to this challenge including television controls that can restrict content based on content rating, channel, or even specific programs or series. In addition, online controls can be used to restrict or monitor the sites children access, or to monitor the interactions with other online users. Now ask yourself the following: Am I currently making the best use of television and online parental controls? Do I or my children know about “medial literacy” and “digital citizenship”, and how virtual-world (online) communication or behavior can have real-world consequences? The Cable Impacts Foundation is working hard to spread awareness and keep parents informed about these issues. Visit ControlwithCable.org today to discover tools, tips and educational resources for both television and online parental controls. Go now! It’s too important to put it off another day. With the kids back at school, make learning a priority even outside of the classrom. Organize some fun & creative after-school activities you can do with your child that also serve an educational purpose. Here are some ideas that let you spend time with your kids after a long school day that will keep them entertained and let their creativity shine. It is a given the first thing on your child’s mind leaving school is food, and waiting for dinner time will not go well with them. Set some ingredients in the kitchen and let your creative juices flow by designing different creatures using food in the pantry. Make this a frequent hobby you and your child can look forward to. Our imaginations are at their peak before we grow up and allow responsibilities to dominate. Encourage your child’s out-of-the-box mind to flourish by having them create a picture book or even conjure a story using their edible art. Make two activities by designing your own puppets and putting on a show. Rather than leave your kids alone playing video games, make a game that will instill some positive competition and expand their knowledge. Base your games off existing ones but put your own educational tweaks on them. This will especially help develop proper grammatical and spelling skills. Introduce a science lesson at home and build responsibility for your child by planting a garden in your yard. It is never too early to encourage your kids about being eco-friendly and care about the environment. Give your kids a larger canvas to let their creativity burst with some street-chalk activities. Make a math lesson with your own custom hopscotch game or tell a story on your driveway or sidewalk.